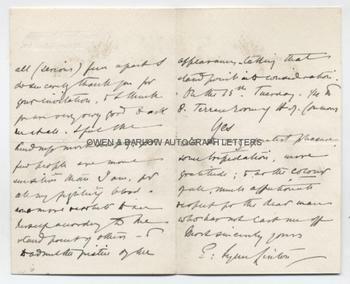 ELIZA LYNN LINTON Autograph letter Signed. British (English) journalist, essayist and novelist. ALS. 4pp. Queen Anne's Mansions, St. James's Park, S.W. Sunday, April 6th [no year]. To [William] Woodall. Together with a fine contemporary portrait photograph. "I think you might feel somewhere about your shoulder blades for those wings which must be sprouting. You are the most anglic-tempered man that ever lived. The fount of your human kindness is inexhaustible, the cloak of your charity covers every renegade. What can I say to express my deep sense of your loveliness? No, but all (serious) fun aside I do sincerely thank you for your invitation, and I think you are very very good to ask me at all. I feel the kindness most deeply, for few people are more sensitive than I am, for all my fighting blood, none more ... [?] to see herself according to the stand point of others and to admit the justice of her appearances - taking that stand point into consideration. On the 15th,Tuesday quarter to eight, Terrace Rooms, H[ouse] of Commons. YES with the very greatest pleasure, some trepidation, more gratitude; and as the colour of all, much affectionate respect for the dear man who has not cast me off". 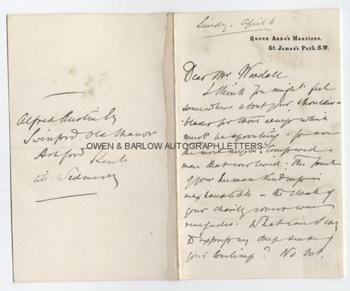 On the verso of the last leaf she has written "Alfred Burton, Esq. Swinford Old Manor, Ashford, Kent. Till Wednesday" which was presumably a temporary address where she was staying. 12mo. Approx 5.5 x 3.5 inches. Evidence of previous mounting to the right edge of verso of last leaf, else fine. The portrait of Eliza Lynn Linton is a fine 19th century gelatin silver print photograph measuring approx 5.75 x 4 inches (excluding mount). It shows a bespectacled Eliza Lynn Linton with a penatrating gaze at the camera, in head and shoulders vignette. 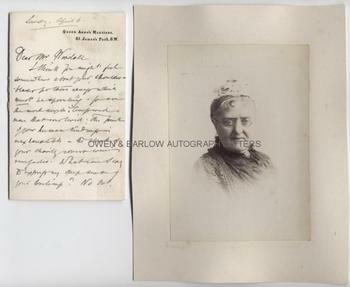 It is mounted on card from an album leaf and is in fine condition. Eliza Lynn Linton was born in Keswick and came to London as the protege of Walter Savage Landor. After a spell as a not very successful novelist, she turned to Journalism and writing for periodicals. When she joined the staff of the Morning Chronicle Eliza Lynn Linton became the first salaried woman journalist. She also contributed to Household Words and collaborated with its editor Charles Dickens on articles and short stories. She was an outspoken adversary of the feminist movement and a critic of what was termed the "New Woman". 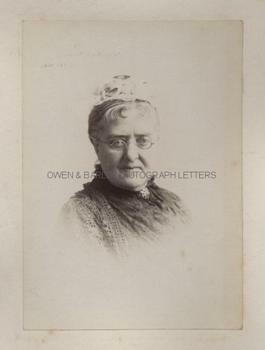 She was a close friend of William Woodall, which is curious as Woodall was one of the main advocates for women's suffrage and womens' rights generally. Often outspoken and controversial in her views, the tone of this letter suggests that Eliza Lynn Linton had recently offended and all but Woodall, it seems, had been rather shunning her. Both the Letter and the photograph are from a 19th century collection made by the radical Liberal M.P., William Woodall.